The book tells how Knoblock, a farmer’s wife and the mother of a young boy, was found slaughtered on her kitchen floor on May 30, 1925. Several innocent men were taken into custody before the victim’s husband, John, was accused of the crime. He was tried twice before being acquitted. Eighty years later, Staresinic-Deane studied the investigation, which was doomed by destroyed evidence, inexperienced lawmen, disappearing witnesses, and a community more desperate for an arrest than justice. She would also discover a witness who may have seen the murderer that fateful morning. Staresinic-Deane began researching the murder after a folder containing old newspaper clippings fell at her feet at the Emporia Public Library, where she worked as a library assistant. In her blog, Staresinic-Deane writes: “I spent the next few years searching for the truth. I visited small towns, interviewed people who remembered the trial first hand and descendants who heard the stories. I dug through courthouse records and newspaper clippings. 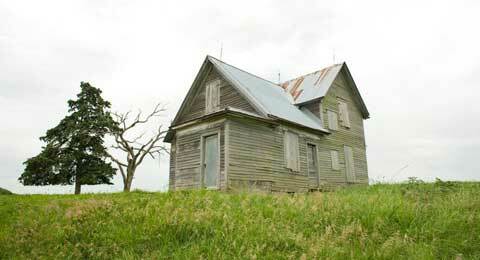 I looked inside the murder site – an old farmhouse that stands empty in a pasture – and retraced the steps of the bloodhounds and the contradictory steps of the investigators. 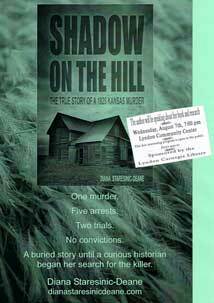 Shadow on the Hill: The True Story of a 1925 Kansas Murder is available in paperback and eBook formats. Staresinic-Deane will discuss the book and her research during the open house at Lyndon Community Center. The event is sponsored by the Lyndon Carnegie Library. For more information, contact Sarah Walker-Hitt, librarian, at 785-828-4520, or see www.dianastaresinicdeane.com.